This Black and Decker juicer is one of the more affordable juicers available for purchase on Amazon. However, the price hasn’t seemed to hurt the quality according to the customers since it has a four star rating and 2,144 total reviews. This is actually a popular juicer brand. These juicers frequent stores often, as well as TV commercial spots. A 2 year warranty is definitely a draw in case something goes wrong with the product early. However, the Black and Decker seems to have some high quality features. As stated on the Amazon page, “the 28-ounce pulp collector allows you to manage your pulp. Choose how much pulp you want in your juice and use the left overs in great recipes. The 400-Watt Motor is built to tackle even the toughest produce with confidence. There are a lot of similar options out there for a lower price range. However, keep in mind that cheaper is not always better when it comes to quality. But the decision should be based on a combination of your needs and what you are willing to spend. Don’t make the mistake of choosing a lower price over quality. It may come back to haunt your or at least make you feel bad for wasting money. Before deciding on the Black and Decker, consider at least two other options. Two other contenders, that are quite popular and would be worth thinking about, are the Breville BJE200XL Compact Juice Fountain 700-Watt Juice Extractor and the Omega J8006﻿﻿ Nutrition Center Juicer. The Breville BJE200XL Compact Juice Fountain 700-Watt Juice Extractor has a sleeker design and comes in a silver color. Its compact design takes up less space, with all of the juicing capabilities of other juicers. It has 400 watts of power plus a stainless steel cutter and strainer juices all your favorite fruits and vegetables with ease. Despite having to purchase a longer warranty, the Breville BJE200XL Compact Juice Fountain has done well for itself on Amazon. 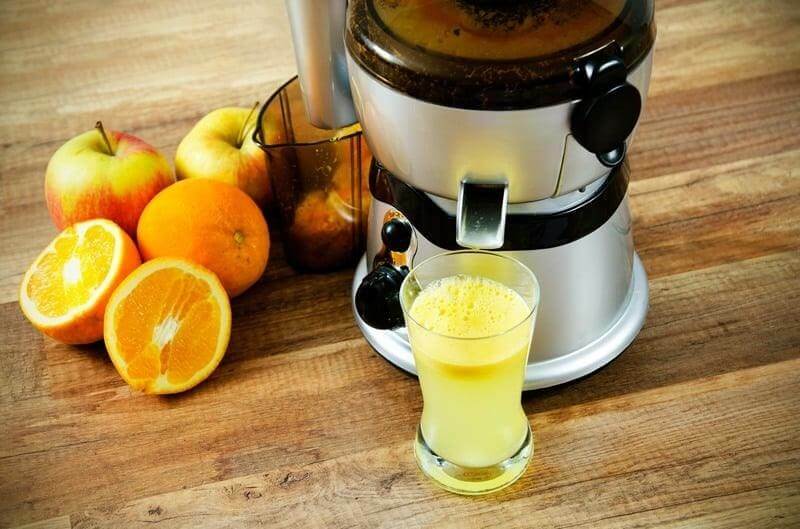 This juicer has an overall 4.5 star rating and 4,526 customer reviewers. It runs on Amazon for around $80. If you are still stuck on deciding to buy the extended warranty, the 3 year protection is around $7 and the 2 year is around $5. The Omega J8006 Nutrition Center Juicer is the most expensive juicer mentioned here. The Omega J8006 Nutrition Center is a masticating style juicer. The low speed protects and maintains healthy enzymes, prevents oxidation and allows juice to be stored up to 72 hours without degradation. Make delicious and nutritious drinks and snacks that everyone will love for around $300. The Omega J8005 Nutrition Center Juicer﻿﻿ is a low speed, masticating style juicing system. You can turn nuts into nut butters, make baby food from natural, fresh ingredients, whip up soy milk, extrude pasta, grind coffee and spices, and mince herbs and garlic. The Omega’s powerful gear reduction is equivalent to a 2HP Motor. Juicer processes at 80rpm's. Low speed or masticating style juicer squeezes, instead of grinding, which allows the juice to maintain its pure color, natural taste, vitamins and nutrients. It extracts the maximum amount of nutrients, vitamins, taste and juice from minimum amounts of fruits, vegetables, leafy greens such as spinach and kale, even wheatgrass. The low speed system does not mean a longer time to juice. It means a more efficient juicer. More nutrients and antioxidants, plus better flavored juice and freshness .The Omega is specifically engineered for quiet operation and longer life. The low speed system also limits froth and foam preventing oxidation. Juice can be stored for up to 72 hours without degradation or the juice separation that occurs with other juicers. It really seems appropriate to rank these three juicers by your level as a “juicer.” The ﻿﻿Black and Decker would be a great start for a beginner because of its lower price and lesser features. There’s less to be frightened about if you are nervous. The Breville ups the wattage to 700 for those less intimated and even comes with a 2 year warranty. The Omega (appropriately named for those not new to the game) does cost a whopping $300, but it is a special masticating type juicer more inclined to get some serious juicing done. Not to mention its many other features. It’s probably best to decide through a bit of research and choose the juicer best suited to your comfort level, price range, and needs. Consider what exactly you need in a juicer, what you will be using it for, and the amount of money you are willing to spend before you purchase such an expensive piece of machinery. You don’t want to make a decision you’ll regret. For those just getting into the juicing game and don’t want to spend too much, try the Black and Decker. Maybe you want a more advanced juicer without breaking the budget. Get the Breville. Want to go all out? The Omega is an awesome juicer.